L-Foot Tension Wound Finned Tubes also known as Wrap-On Finned Tubes, are used in applications where temperatures do not exceed about 300 degrees Fahrenheit in other words for low-temperature application where some degree of tube wall protection is required. L-Foot tension wound finned tubes consist of thin aluminium fin strip tightly wound helically around the tube circumference. A “foot” is first formed on one side of the fin strip (hence the name L-Foot). The strip is then wound tightly around the tube, with the foot bearing on the tube outer surface. The short horizontal limb of each L is in contact with the base-tube surface to cover it completely. Tension in the fin strip as it is wrapped around the tube serves to seat the fin foot forcefully on the tube, and to hold the fin firmly in place. L-footed finned tubing offers maximum heat transfer at lower temperatures. The unique L-shaped design holds fins rigidly to withstand heat cycling and high velocity air vibration. This fin offers a certain degree of atmospheric protection of the tube wall against corrosion. The broad contact surface between the tube and the finning enhances heat transfer. This fin design is highly efficient yet cost effective. The ends of the fins are stapled to prohibit the aluminium fin from unravelling, and loosing the contact between the fin foot and the tube. This contact is critical to the operation of the air cooler, since the heat is transferred from the tube wall, through the fin, to the surrounding ambient air. The finning type is the most cost effective method compared to the others. The failed fins can be easily removed during production and bare tube can be used again for finning. There is no need for make a helical grove over the core tube. It is possible to place the fins on a very thin-walled tube with is particularly desirable when using expensive alloys as core tube. 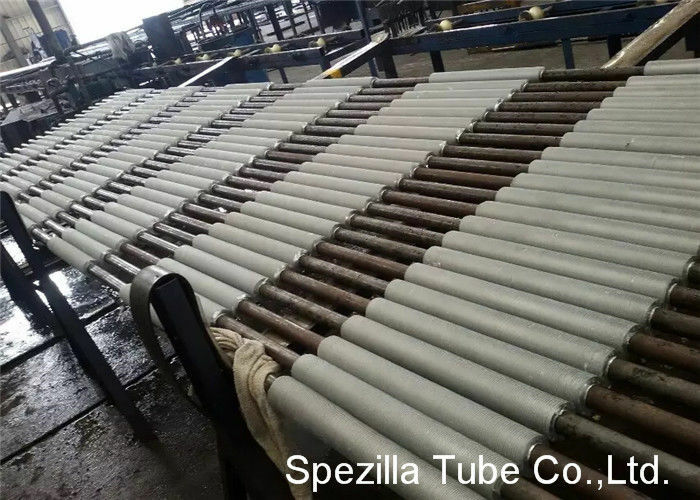 The tube can withstand a temperature of up to 130°C without the risk of atmospheric corrosion or thermal stress. Handling shall be done with care to avoid any damage. The Fin Strip Is Wound Into A Machined Groove And Securely Locked Into Place By Back Filling With Base Tube Material Under Pressure. This Ensures That Maximum Heat Transfer Is Maintained At High Tube Metal Temperatures. Maximum Operating Temperatures For This Fin Type Is 450°C. The Strip Material Is Subjected To Controlled Deformation Under Tension Giving The Optimum Contact Pressure At The Foot Of The Fin Onto The Base Tube Thus Maximizing The Heat Transfer Properties. The Foot Of The Fin Considerably Enhances The Corrosion Protection Of The Base Tube. Maximum Operating Temperature For This Fin Type Is 150°C. Manufactured Exactly As The ‘ L’ Fin Except That The Base Tube Is Knurled Before Application Of The Fin Foot. 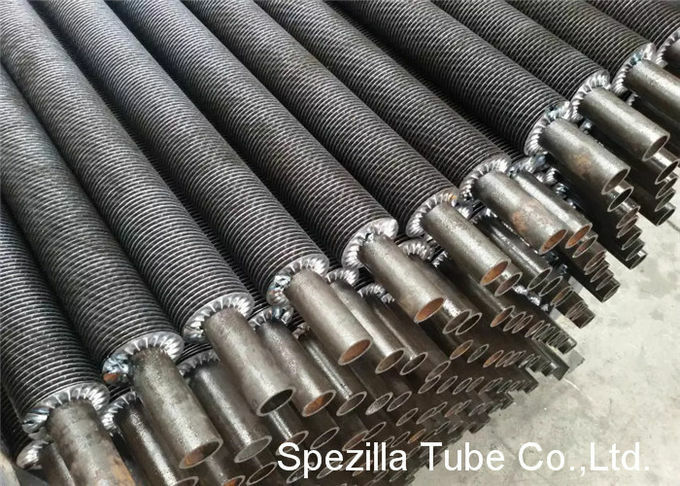 After Application The Fin Foot Is Knurled Into The Corresponding Knurling On The Base Tube Thereby Enhancing The Bond Between The Fin And Tube Resulting In Improved Heat Transfer Characteristics. Maximum Operating Temperature For This Fin Type Is 260°C. The Main Tube (mother Tube) Is Covered With An Aluminum Muff And The Fins Are Formed Using The Forming Force . This Results Into Very Good Mechanical Bonding Of The Aluminum Muff With The Mother Tube To Have A Very Good Heat Transfer Properties. The Fins Cover The Whole Tube & Have A Very Good Anti-Corrosive Properties. Maximum Operating Temperature For This Type Of Fin Is 350°C.